Whether it’s a big family break, a birthday celebration or a hen do, a getaway with friends or a romantic weekend for two, we have glamping to suit everyone on our beautiful country estate in the heart of Dorset. All of our sites are unique and exclusive to you and your party. There are no shared amenities with the other camps which are a 5- 10 minute walk away giving you a totally undisturbed stay. Brickles Yurts - Sleeps 12. A traditional yurt camp which can sleep up to 12 in 3 yurts, with a fabulous living yurt, campfire, kitchen & bathroom facilities. More info & availability. 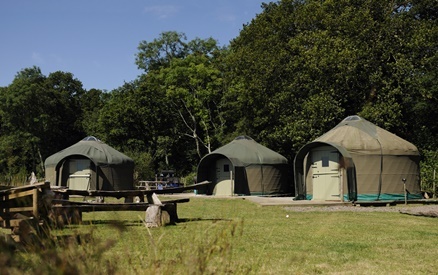 Withybed Yurts - Sleeps 14. 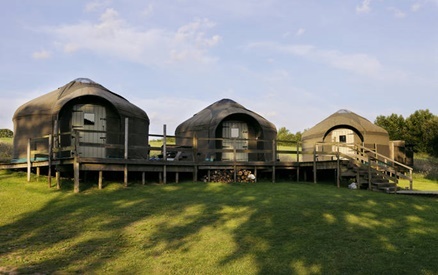 Three sleeping yurts and a living yurt pitched on raised decking with a sun-soaked outdoor eating area and kitchen, a large living yurt, campfire, our famous under the stars bath, shower and toilet facilities. More info & availability. Parsons Camp – Sleeps 11. All aboard our amazing retired tourist bus! Sleeping 5 downstairs and hosting an indoor kitchen and eating area as well as an open-topped dining area! 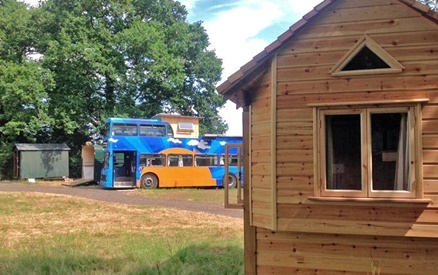 A bunkhouse and shepherds hut will house 6 more overnight and guests can enjoy a horsebox bathroom! More info & availability. Sawpits – Sleeps 2 (& 2 children in own tent). Enjoy the cosy comforts of our woodman’s wagon with a double bed, small dining and living area and kitchen facilities. Step out on the decking to watch a glorious sunrise as you sip your coffee or set sun with a glass of wine. Nip outside to find your shower and loo with a view! More info & availability. Note: Withybed, Brickles and Sawpits can allow for two more guests each with their own tent and bedding for a small fee. All of our yurts, furniture & conversions have been made here at Stock Gaylard using as much of our own wood as possible. 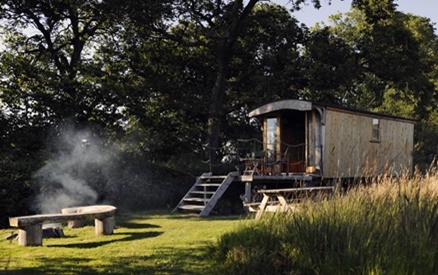 Glamping not for you? What about a chalet by the sea?! Siesta Chalet is just meters from the sea at Eype, near Bridport, made famous by TV series Broadchurch and will sleep up to four. More info. In order to confirm your chosen Booking, you must pay a non-refundable deposit as required by the Owner of the Booking in question (or full payment if booking within 4 weeks of the date of your check-in). All monies paid for a holiday (deposit and balance) are non-refundable within 4 weeks before check in date. You are under a responsibility to behave in a proper, appropriate and legal manner whilst staying at the property. You are responsible for informing the Stock Gaylard Estate of any losses or damage to the property as soon as possible. Please note that you will be liable to pay for any losses or damage to the property caused by you or a member of your party (except reasonable wear and tear). You must also leave the property by the check-out time specified on your booking. If any guest behaves inappropriately or improperly or illegally, the Stock Gaylard Estate reserves the right to ask the guest and their party (at their discretion) to leave the Property before the end of the holiday period and/or refuse any future bookings from you. Any refund for so doing will be at the entire discretion of the Stock Gaylard Estate. In addition, the Stock Gaylard Estate reserves the right to sue the guest for any loss, damage or injury caused to any member of staff, the Property or to other guests and/or their property.